Lead Discovery understands that purchasing quality leads is only half the battle. Equally as important is how you manage your sales leads. We put you in control of how your leads are tracked, distributed and worked using our free online lead management system. By giving you the tools to manage your leads more effectively the more sales you will close thus the more leads you can buy, a win win situation in our view. 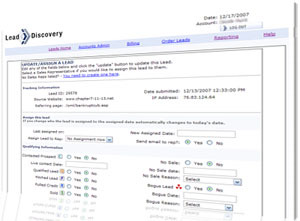 The Free Online Lead Management system is just another reason why Lead Discovery has changed the industry. Do your sales reps have a backlog of appointments, or perhaps a number of credit report pulls, but no pitches? Have they closed the deal, or was it a no sale? With the lead management system you can see their lead pipeline and assign leads accordingly. Assign leads when needed and only to those who are ready to work a fresh lead. Do your sales reps hoard up leads and sit on them until they are ready to work them? This happens in every sales room we have seen, put an end to it. Control how many leads are delivered onto your sales floor. We give you a view into each of your sales reps lead flow. This will give you the ability to assign leads only to sales reps who are ready for them. Not when they simply want one, but when you can see that they have worked the leads already assigned to them and fresh sales leads are needed. Balance is the key to a hungry and effective sales room, if you don’t know where your sales reps are at in the sales cycle with their chunk of leads you can’t expect to achieve the maximum number of sales. As mentioned above, your sales administrator or manager can review each debt lead as soon as they come in and then assign that prospect to a specific sales representative. This gives you the opportunity to quickly distribute leads and match a particular debt problem with a sales representative with expertise in that area, or match a New York lead with a New Yorker sales rep, or put your best closer on prime high debt load deals. You know your sales team; we give you the control to quickly put the right leads into the right hands. You can evaluate the performance of your leads, individual reps and the sales room as a whole at anytime. With reports on key factors such as contact ratio’s, credit report pulls, full pitches and of course closed deals you will always know how your room is performing with Lead Discovey’s leads. Use this information to pinpoint bottlenecks or areas where sales representatives need more training. Combine all the benefits of the free online lead management system with low cost, real time debt relief leads, and you will quickly see why aligning yourself with Lead Discovery will result in increased profits. We’re confident you will be pleased. ITS FREE! That’s right free, no upgrade costs, no maintenance fees, nothing.. FREE.